In honor of adding some new items to the Poleitical Clothing line, we’re having our very first Instagram Photo Challenge Giveaway! One winner will receive one of our NEW SWEATSHIRTS, which will be debuted at the Pole World News Awards on March 21st, in Los Angeles!!! 1) You don’t have to post a photo every day, but you do get only one photo per day as an eligible entry. 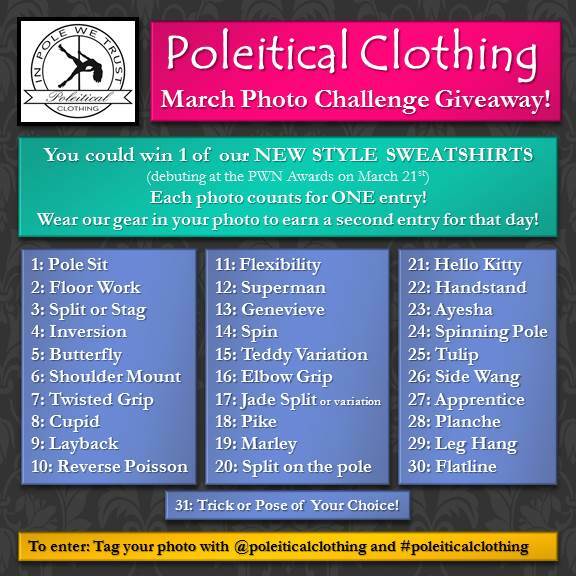 2) You may earn 1 bonus entry per photo by wearing your Poleitical Clothing gear in the picture – it must be visible to camera to qualify! 3) This giveaway is open to US and International entries! 5) Be creative with your choices! Video or photo is allowed. 6) If you cannot perform a trick, i.e. a Jade Split, it is permissible to do a variation as long as that variation is clearly from the same trick. 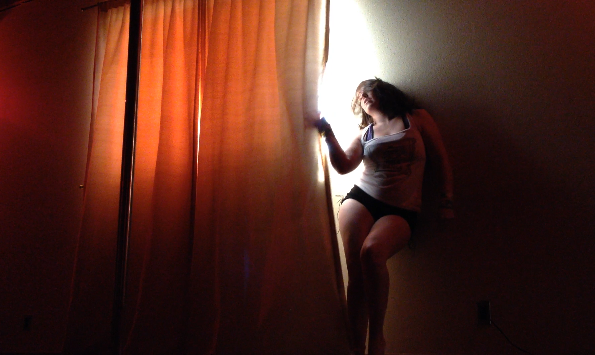 7) Contest runs March 1st, 2014 through March 31st, 2014. 8) Contest entries must be posted via Instagram. You must follow Poleitical Clothing, and you must tag Poleitical Clothing by their username and with a hashtag, i.e. @poleiticalclothing and #poleiticalclothing, for your entry to count. If you have a private profile, you must approve us as followers for your entries to be counted. 9) Prize value is approximately $50 USD, not including shipping. Sweatshirt will be shipped from Los Angeles, CA (shipping covered by Poleitical Clothing). Please allow up to 4 weeks for delivery – we will let the winner know when it ships. Not redeemable for cash value. Winner will be notified via Instagram and must respond within 1 week of notification with their contact info and size choice via email, or a new winner will be chosen. Chances of winning depend on number of entries.